Oracle on Monday announced the next version of its cloud-based business intelligence suite for retailers, adding new data-driven segmentation capabilities to help marketers and retailers identify why customers buy certain items so they can tailor and personalize offerings to each individual. Released at the National Retail Federation’s (NRF) Big Show, Oracle Retail Release 15 adds new data-driven capabilities to the software giant’s suite of business intelligence solutions for retail businesses. It features four new cloud services to increase sales, traffic and productivity. Of special note is the new Oracle Retail Customer Segmentation Science Cloud Service, which helps identify why customers buy certain items and what promotions might entice them to buy in the future. Retailers and marketers can leverage this data-driven tool to build brand loyalty, strengthen customer relationships and increase overall company revenue. "For the first time, retailers can use Oracle Cloud services to pinpoint promotions customers want to see, forecast and meet demand for items with unique attributes and manage inventory in a singular, more effective manner across commerce, store and wholesale channels," says Jill Standish, senior vice president and general manager at Oracle Retail. Companies also can now integrate Oracle Retail Xstore Point-of-Service with their merchandising solutions to communicate data insights between stores, merchandising teams, pricing and sales audit processes. 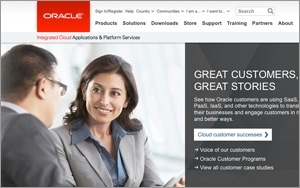 The new Oracle Retail Xstore Point-of-Service Workstation solution is also now mobile-friendly. Oracle Retail Merchandise Financial Planning Cloud Service streamlines communication between commerce, store and wholesale channels for more effective business strategy planning, while the Oracle Retail Demand Forecasting Cloud Service helps retailers identify the correct pricing and promotional campaigns for products.